How can you soothe a crying baby? 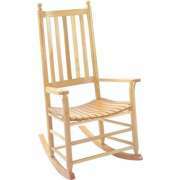 Just dreamy might be the best way to describe our comfortable, sturdy rocking chairs. Caregivers can cuddle a tired child as they relax and snuggle into a cozy glider chair. The gentle, smooth, repetitive motion of a rocker chair gives babies the reassurance they need to drift off or eat peacefully. Hertz Furniture&apos;s rocking chairs are designed to support both babies and caregivers. An inviting appearance and convenient features make them an excellent choice for any daycare center. We even have child-size models which enable little ones to calm themselves with relaxing motion. Tired of spending all day walking back and forth to calm distressed babies and toddlers? Are your arms starting to ache from lifting and rocking little ones? 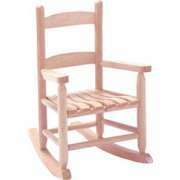 A supportive rocking chair offers a great alternative to walking around and carrying growing children. Babies and toddlers get the same benefits of calming movements in a glider chair and caregivers can relax as well, rather than straining their backs and arms. 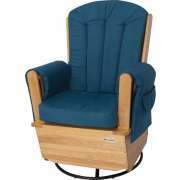 Do I need a rocker or glider for my daycare? If you don&apos;t want to be carrying toddlers around all day, you will definitely want a glider chair. When children recognize that a rocking chair is a place to rest and calm down, it will become easier to help them relax. Gliders aren&apos;t only helpful for children who are upset, they can also be used to lull a child to sleep or feed a baby. If you want to have some quiet personal time with one or two of the toddlers in your daycare, you can cuddle up and read a book together in this cozy venue. What kinds of chairs should I get for my childcare center? Appropriately-sized furniture is beneficial in any early-childhood setting. 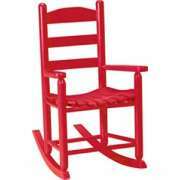 Child- and toddler-sized rocking chairs will make a great addition to your classroom. They enable little ones to relax, calm down and take a quiet break in a comfortable personal space. Toddler rocking chairs encourage children to take initiative in finding their own ways to compose themselves and step out of overwhelming situations. 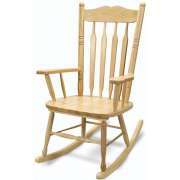 Rocking chairs can also be a great accessory for your early-childhood learning center for imaginative play, where children might want to practice being the caregivers themselves by “soothing” dolls and animals. How can I make my daycare center more homey? 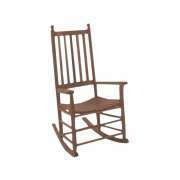 Solid wood rocking chairs from Troutman Chair have a home-style appeal that is reminiscent of classic western decor. They come in adult, child and baby sizes so you can order matching models for all ages. Their solid oak construction provides the toughness you need for the everyday rigors of a busy daycare. Classic-style chairs will add a cozy homey feel to any childcare setting. Our wooden rocking chairs are available in a selection of finishes. Unfinished models save you money and enable you to create a custom design or paint them in a particular hue that coordinates with classroom decor or other furniture. They also come in a natural wood finish as well as a selection of both vibrant and more subdued hues. What is the most supportive glider chair? When safety and health are at stake, you don&apos;t want to take any chances. With glider chairs and rockers from Foundations, you get the utmost in support and comfort for both babies and their caregivers. Fully-padded backs and arms protect babies&apos; heads from the solid wood frames, while ensuring that caregivers can sit in a healthy position. The swivel and gliding mechanisms are designed for smooth repetitive motions which are relaxing for anyone. 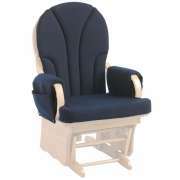 In addition to a safe and functional design, Foundations glider rocking chairs have a number of convenient features. Deep pockets provide an accessible space to store pacifiers, books and blankets so you don&apos;t have to keep on getting up to retrieve supplies. The fabric seat cover and side panels are easily removed for cleaning in the event of an accidental spill. These little touches make a big difference in a setting where a glider rocking chair is used on a daily basis. Whether you choose child-size rocking chairs or swivel glider chairs for caregivers, this cozy piece of furniture is sure to make a welcome addition to any learning space. Teachers and children alike can benefit from having a soothing spot to relax and calm down in during the day. If you need help determining the ideal chair size or understanding the benefits of a particular model, contact the Hertz Design Center for free project-planning advice.